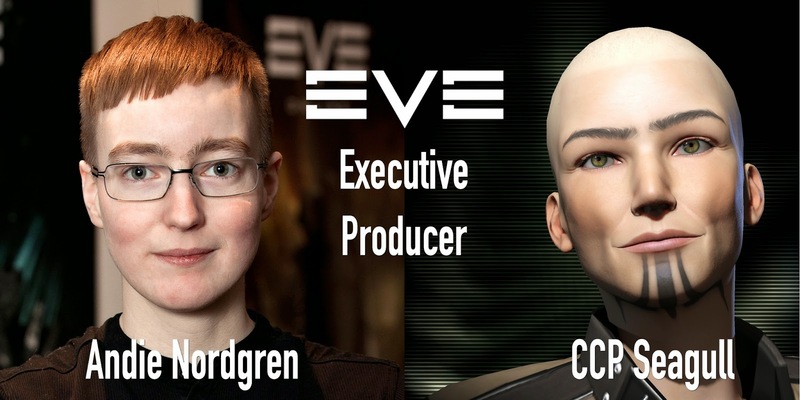 It was recently announced that CCP Seagull has been promoted to Executive Producer of EVE Online. JimmyDuce: How did you come up with your name? WubWubMillerMinmatar: With your promotion/new position, what new responsibilities do you have at CCP? Are you in charge of more people directly? CCP Seagull: New responsibilities include the budget and business responsibility for EVE - and also marketing, operations, customer support - working with those departments in CCP to do that work on EVE. Squizz: In your new role, what changes might we see you attempting to implement? CCP Seagull: Even more tools for players and 3rd party developers, and more marketing stuff made in a way that reflects the actual game and that would be useful for existing players to link to if they are trying to explain why EVE is something to care about. Work_Suckz: Is there some up and coming feature, whether small or large, that you are particularly happy or excited about? WubWubMillerMinmatar: How does the shortened dev cycle appear to be affecting the workplace? CCP Seagull: The new cycle is like a small miracle in motion - it frees us to think new things, and being able to make changes and then follow up so soon just gives so much more power to teams to drive their features in a good way. Eve_Asher: Now that you have 10 releases a year do you have any plans to make balance changes more proactively since if you go overboard you can revert/tweak easier as well? CCP Seagull: The new release model gives us whole new possibilities for more frequent balancing work of the kind that you describe - we no longer have to make only big changes that we are confident will last for years - we can tweak and respond to the environment in the game. We do not want to more towards a "flavor of the month" kind of environment though, so there's lots of careful work to do for our designers. Specifics about ships I won't answer - that's all for the design team! LG03: It's fairly obvious that people are unhappy with the current state of affairs with regards to nullsec politics and sov mechanics. Every day there's multiple posts just here on reddit with new schemes to 'fix' null. There's a growing sentiment that if the current situation continues unabated that it may be a precursor to the end of EVE. Is CCP content to remain hands off or are there changes in the works, if so can you discuss anything in particular? CCP Seagull: We have change coming! We are hands-off when it comes to the specific interaction between players, but certainly not hands-off when it comes to designing how the game works. We have things in the works, and you'll hear more about it soon as we start talking about our plans - but that will come from the teams working directly on it - I am not going to present some specific solution here. But we are working on what to do, and because we are already on a long running plan where fixing industry, creating the mobile structures, improving corporations and alliances was always building up towards making major improvements to nullsec and sovereignty, we are in a pretty good place to start making changes now, especially with our new release model. MagCore: I really get a sense of your enthusiasm and passion when you talk about the game. When you talk about "re-imagining sov" it gives hope to us 0.0 players. Are you able to give any kind of generalized timeframe/progress on this? CCP Seagull: We will start this year, with changes in one or more of the remaining releases this year. Those will not be changes that will be the single solution to sov, but rather changes rolling out continuously to make things interesting. And as we continue work on new structures, and new corp and alliance functionality, we will be able to do more and more interesting things, especially about connecting smaller group actions and ownership of space or structures to the bigger picture warfare in new ways. JayRizzo03: With the current state of SOV Null-sec, any small up-and-coming alliance really only has a few options - join one of the major coalitions or be completely irrelevant. Are there any plans to give smaller alliances a nudge? CCP Seagull: We want more things to do for smaller actors - so that's one aspect we definitely keep in mind when planning changes for null sec, corporations and alliances. The challenge is to create space for smaller groups to be independent and have cool stuff to do, but still mattering in the bigger picture in interesting ways. Zonetr00oper: Bazillion questions about the stagnation of null aside, you've promoted a heavy focus on player actions and their repercussions within the game world - the idea that the players create all the content. While admirable, it has also been accompanied by an almost total cessation in in-universe news articles, lore production, and plot-line advancement; even nullsec clashes which once received short news writeups now go unmentioned unless you happen to read various EVE fansites. The once vibrant, living universe has ground to a halt awaiting player 'content', which too often comes in generic battles and silly kills; the live events and fiction teams have also suffered heavily in the layoffs. My question is this: Do you have any plans to restart the universe of New Eden? Will we ever again feel like we are flying through a living, breathing universe, populated by planets, stations, and people who are doing their own things not even necessarily immediately connected to us? CCP Seagull: That was always my wish for people to feel like that - and we'll look at our various ways of keeping the universe active. For me, the world should be a living, thriving backdrop - not something that never changes and just waits for player action. Druishmonk: What sort of Plans does CCP have for wormholes, and did CCP expect so many players to live permanently in W-space? CCP Seagull: We'll keep doing stuff with wormholes - we have a few changes coming in the upcoming releases this year but I'll let the involved designers speak to what they are - check the forums for feedback threads and feature announcements. zulef: Are we ever going to see anything new done with missions? They've been pretty much left untouched for the past decade. CCP Seagull: Yup, some changes and new missions coming in the next releases! CCP Seagull: When we have the SSO reliably out there and a suitable set of endpoints to start with. Corran_Halcyon: The simplification of many features is a good progression, but I am worried that CCP may begin to over simplify EVE features in order to attract new players and keep them interested. CCP Seagull: Our ambition is to remove bad complexity but keep EVE a game that is challenging and interesting. Link to the Reddit post.